John Phillips, Michelle Phillips and Denny Doherty performed in the New Journeymen, a temporary group put together to fulfill contractual obligations after the original trio’s breakup. In 1965, the three of them then headed to St. Thomas, in the Virgin Islands, to write and rehearse. They were joined by the alto-voiced Cass Elliot. The foursome relocated to Los Angeles, where they signed to Lou Adler’s Dunhill label. After briefly calling themselves the Magic Circle, they took the name The Mamas and The Papas. The Mamas and The Papas were inducted into Rock And Roll Hall of Fame in 1998 (Performer). The Mamas and the Papas were the royal family of American rock-not because their music kept growing and progressing to plateau after plateau of greatness (it didn't), but because they were the first, with the Spoonful, of the big American groups, the first, that is, since the Beatles. Besides, they looked regal. John Phillips, tall and stately, looked like Everyking, Cass Elliot, majestic earth mother, like Everyqueen, and Michelle and Denny the essence of princehood and princeshood. they came to us, that dreary winter of 1965-66, singing that all the leaves were brown and the sky was grey and that it was a good time to dream of California. Until then, everything new and interesting and commercially successful (all those things can go hand in hand) was English and had been since 1964 and the Beatles. Then, with the Mamas and the Papas, the spotlight that had been fixed so firmly on Liverpool and London suddenly swiveled over to America (and caught the Spoonful's Daydream as well). America had had dylan, of course, but not a group scene with any sort of style, and nothing like those first three singles the Mamas and the Papas brought out in less than a year. The story of the group was new then, though by 1968 there must have been a thousand groups that told variants of it. They came out of the Village folk scene that had developed around Dylan and those who followed him. Cass had been with groups before (the Mugwumps and the Big Three), but these were not particularly successful. As the Mamas and the Papas told it, the four had met in the Virgin Islands, where there was not too much more to do than sing, but still the blend was not quite perfect till a piece of piping fell on Cass and changed her voice. Back in California the sound impressed people in the business who, having made one adjustment already to English moptops, found it difficult to readjust their vision to this motley quartet. The word "hippie" was not then in common use, but the concept existed. Groups in beards and boots and funny hats and strange drag were still new at the end of 1966 and not the cliché they became in 1968. The way this group looked, once the music business got over the shock of it all, was a novelty and very promotable. And the Mamas and the Papas were a sensation musically, visually and commercially. And what was really exciting was that they managed to establish the fact there was an American scene. This was America's answer to the British invasion. Because of all this, it's quite incidental that the Mamas and the Papas never did live up to the glorious promise of their first year and that although every album they did sold, by the time they got their fourth, in 1967, they just couldn't do it, couldn't put out another bland, predictable, salable, repetitive product. So in the middle of it all, in the middle of the taping, they just cut out, splitting to England and Europe to clear their heads and rethink their music and their lives, and give themselves a rest. It was a case of too much too soon-too much work, too much touring, too much freshness expected of them and too much too think about. No one really minded. Everyone understood. By 1968 Cass decided she wanted to sing solo. They had never intended to stay together any longer anyway, they all said. John Phillips, particularly, wanted to be so much a performer as a writer, producer and discoverer of talent. 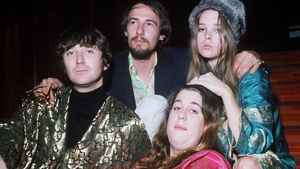 Always there was much more to say about the Mamas and the Papas than the sweet-sad harmonies and the number one hits. They really were the first hippies to make it big and strike it rich, living in luxury in Bel Air and setting a bad example for the neighbors. Later, when other hippie groups made it, it no longer seemed unusual. But it was the Mamas and the Papas who established the precedent.